WISCASSET — Twice a month, for two or three decades, Charles and Stanley Wick have had lunch together at their favorite restaurant, Le Garage. Ever since hearing the news that it is closing on Sunday, they have eaten there twice a week. 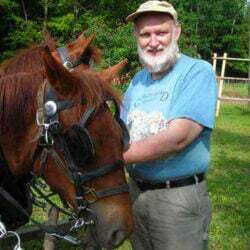 On a recent Friday, the brothers – both retired residents of Damariscotta – enjoyed bowls of French onion soup at a table overlooking the Sheepscot River and reminisced about eating at Le Garage when their parents were still alive. Stanley Wick still tears up thinking about how kind the staff was when they heard his mother had died. He got hugs. Le Garage has been in Wiscasset for 40 years – longer if you count its beginnings as a small take-out spot that sold sandwiches, chowder and ice cream – and some of its employees have been there nearly as long. Alan Dodge, the chef, has cooked at Le Garage for more than 32 years. Barbara Wyman has been a server there nearly 37 years, since the summer of 1980. Others on the staff can’t boast that kind of extreme longevity but still have impressive employment records, especially considering that today many restaurant owners complain they can’t keep employees six months. 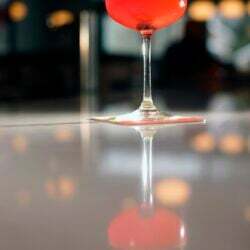 Linda Verney, the chef’s sister-in-law, started working as a server in 2006 after a short stint as a bartender in the mid-1990s. Danny Peters has washed dishes for 19 years. Daphne Cromwell has been at Le Garage for about 20 years, and during one summer in the late 1990s three generations of her family worked there – Cromwell was a server, her mother was the hostess, and her daughter bused tables. Such loyalty from the staff has helped create loyal customers and turned Le Garage into a family restaurant – not in the traditional sense, but by fostering a feeling of family among those who work and eat there. “We fight just like family too,” Dodge said, laughing. Then he turned serious. 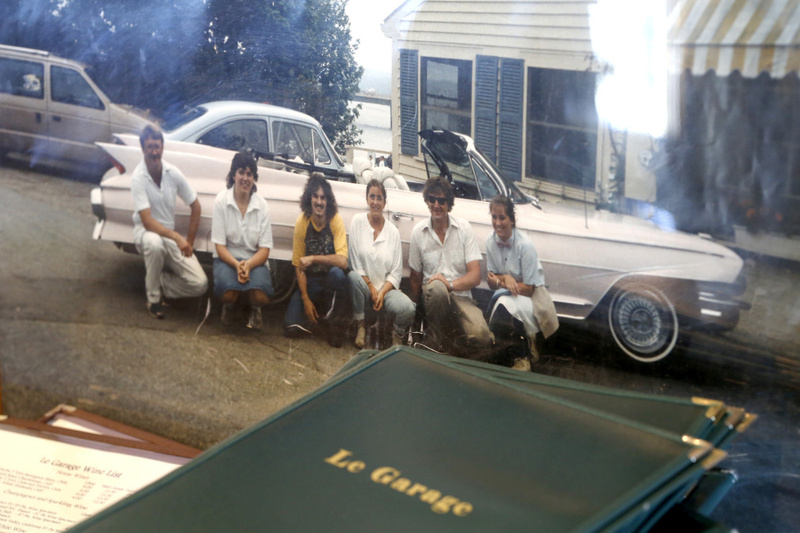 In its heyday, Le Garage was a destination restaurant in Maine. Gourmet magazine featured the seafood platter Dodge created when the restaurant first opened; he broiled the seafood because he had no fryolator in the kitchen. Bon Appetit, owner Cheryl Rust recalled, did a spread on Tree Richardson, the Westport Island woman who was the baker at Le Garage from age 66 until she finally retired at 94. Over the years a few celebrities discovered the place, including Walter Cronkite, legendary UPI White House reporter Helen Thomas, a teenage John F. Kennedy Jr., and former first lady Barbara Bush. Beau Bridges visited Le Bar, the cozy bar Rust added downstairs, while he was in Maine filming “Signs of Life” in 1988; the actor said, Dodge recalled, that he liked the wine list. Le Garage got its name because in the early 20th century it was an auto and engine repair shop. Today, it’s a beautiful cream-colored structure made of formed metal that looks like chiseled fieldstone, with a hip roof. It could have been transported to the banks of the Sheepscot from a field in France, except for one feature that hints of its past – two big, weathered garage doors, painted blue, on either side of the entrance. Linda Verney delivers food to the dining room. Verney has worked at Le Garage in one capacity or another for 14 years. “I still feel like the new kid,” she jokes. As Dodge – much older now but still sporting wavy brown hair – reminisces in the dining room, a young man on his way out the door stops to shake his hand. Dodge explained that the young man once worked as a dishwasher. Dishwashers are usually kids, he said, “so they’re always doing something wrong.” But because they are so young, he doesn’t consider anything they do, really, a fireable offense. 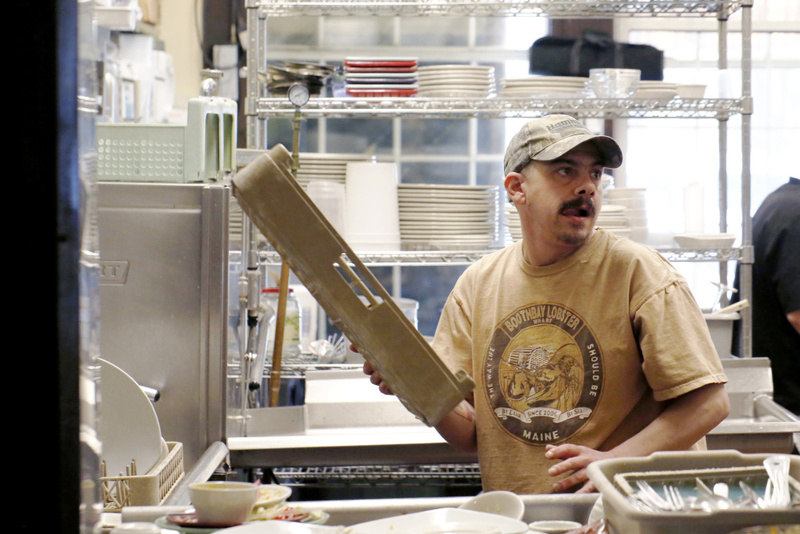 Wyman, the server, says she thinks the kind of employee longevity seen at Le Garage is more common in rural Maine, where there’s often not much work to go around. But nationally, it is unusual. According to a 2014 restaurant workforce survey conducted by the National Restaurant Association’s Educational Foundation, about half of all restaurant employees 35 and older have worked for five or more restaurant or foodservice businesses during their career. Only 3 percent of chefs/cooks have worked for just one restaurant. Dodge himself started at another restaurant. 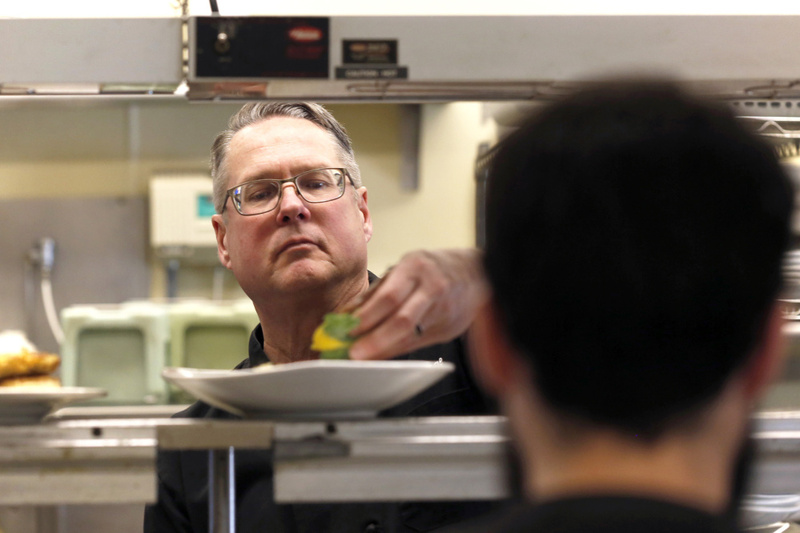 When he was a freshman in high school, he washed dishes at the Dodge Inn restaurant (no relation) in Edgecomb, just across the bridge, and over the years worked his way up to head chef. At age 19, he got a call from Crosby and Charlotte Hodgman, owners of the early take-out version of Le Garage, asking if he wanted to buy the business. Dodge declined, then got another call from Crosby Hodgman informing him they had sold the restaurant to Hodgman’s stepdaughter (Charlotte Hodgman’s daughter), Cheryl Rust, and asking if he would consider being the chef. Dodge agreed. Forty years later, the kitchen at Le Garage is twice the size it was when Dodge, now 60, started. In 1986, Rust added a bakery as well as Le Bar, which offered locals a place to unwind. The view of the Sheepscot from the upstairs dining room is still stunning, despite the removal in the late 1990s of the Hester and Luther Little, two schooners abandoned in the harbor for decades that had become popular local attractions. Le Garage now has 25 year-round employees, and the staff swells to 35-40 in the summer. It has felt a lot like summer at Le Garage lately, ever since Rust announced her retirement. 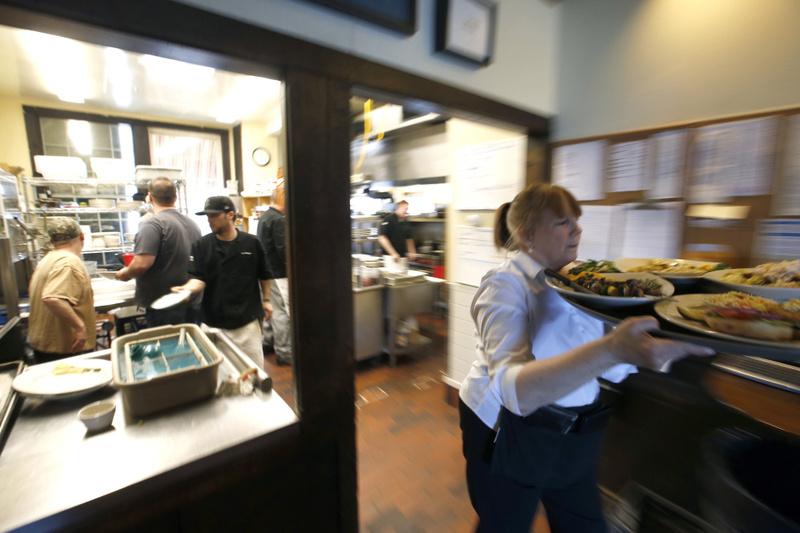 “We’re doing a summer business with a winter crew,” Wyman said in between checking on tables. 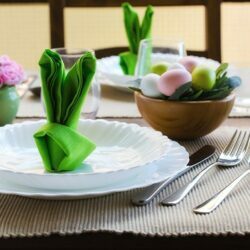 The restaurant is getting more than twice the number of reservations it normally does at this time of year. There are 170 seats, if you include the seating in Le Bar, and on a recent weeknight 83 customers came in. A fan trying to squeeze in one last dinner drove up from Philadelphia, then drove back the next day. “I’ve never seen it so busy,” said Brittany West of Damariscotta, who got her first job at age 15 washing dishes here and now, 15 years later, works as a part-time server. 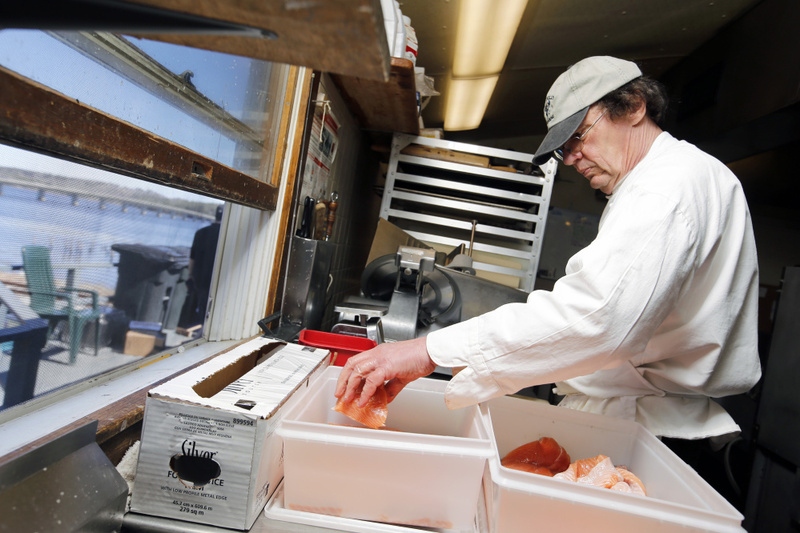 Chef Al Dodge, who has cooked at Le Garage for more than 32 years, prepares salmon fillets. 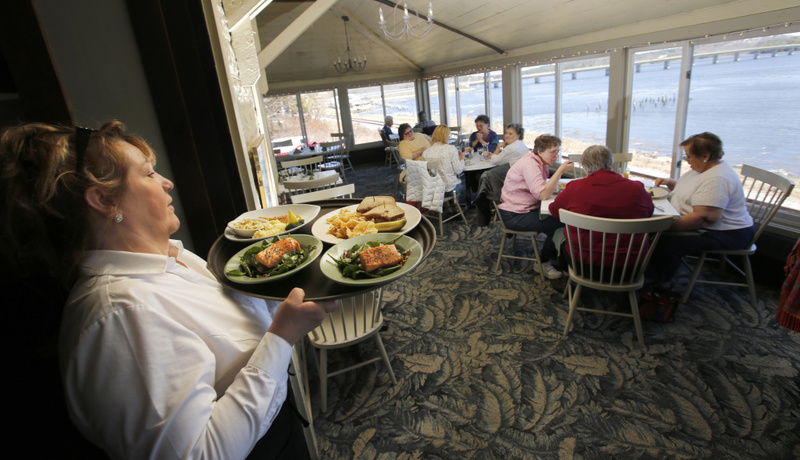 The restaurant – a midcoast mainstay since the 1970s – will close its doors on Sunday. Dodge has had to bring back former employees to help out, including architectural designer Lynn Talacko, who worked summers here for about five years starting in the late 1970s, when he was in college. After he graduated, he continued to work two or three nights a week for years, “just to get some extra money.” He came back about a month ago at Dodge’s request. “Al was desperate,” Talacko said, only half joking. Matt Craig, who worked at Le Garage 11 years, is back behind the line, tossing pasta and folding crepes, and Nate Ridley calls out orders for Reubens, omelettes and plates of creamed finnan haddie on toast. To keep up with demand, Dodge is making seven-pound batches of creamed finnan haddie daily – it’s his grandmother’s recipe. Dodge came back to the Le Garage kitchen last August, just as two prep cooks were retiring – one had been at the restaurant for 27 years, the other for 25. Schildroth sits at the same table every day, sometimes with a client but usually alone. A large label with his name on it is stuck to the wall above the table, serving as a permanent lunch reservation. Schildroth has been here from the beginning, ever since Rust called him in 1977 for help designing a stairway, and for advice on winterizing a screened-in porch. “I’m going to have the pot roast,” Schildroth replies. They talk in their own shorthand. “Gravy, if you’ve got any,” he says. Although Verney looks forward to spending more time with her grandchildren, she’s going to miss what has become her family – and she doesn’t mean just her brother-in-law. “We take care of each other,” she said. Wyman, who is looking forward to her first summer off in 36 years, agrees. When an employee who was a single mother needed her house painted quickly, or risk losing a loan she desperately needed, Dodge recruited co-workers to help. “A whole mess of us went up and we scraped and puttied and painted and turned that house into a wonder in a day,” Rust recalled. West said if former employees come in struggling, Dodge will find something for them to do. Rust says Dodge is “like a brother” to her. West has fond memories of an elderly customer from Damariscotta named Arlene who always arrived dressed to the nines and drank her martini with a straw. As her health failed, Arlene wrote West a letter to say she would never forget her. She left the waitress a bracelet in her will. Rust says the Le Garage building has long been paid off, and she has no debt. She is simply tired. She is selling the building (asking price $775,000) and hopes it may attract another restaurateur. Employees have already made plans for life after Le Garage. Dodge will return to his vacation rental job. West will work at King Eider’s Pub in Damariscotta. Varney plans to nurture two side businesses she owns. Peters, the dishwasher, has a job lined up at Hancock Lumber in Damariscotta. The customers will have to move on as well. The Wick brothers say they’ll probably start going to the Cupboard Café in New Harbor. Schildroth said his other favorite restaurant is Moody’s Diner, but it’s too far away to eat lunch there every day. CORRECTION: This story was updated at 7:25 p.m. on April 26, 2017, to correct Helen Thomas’ affiliation.